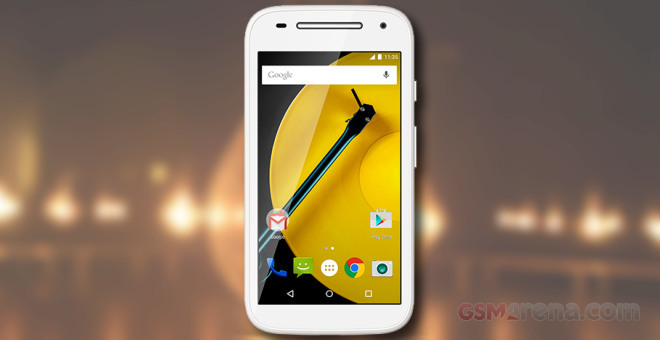 The new Moto E packs a slightly bigger 4.5″ qHD display and runs on the modest, but modern, Snapdragon 410 chipset with a quad-core 1.2GHz Cortex-A53 processor, Adreno 306 GPU and 1GB of RAM. It also has a 20% bigger battery capacity at 2,390 mAh and runs on a vanilla edition of Android Lollipop. 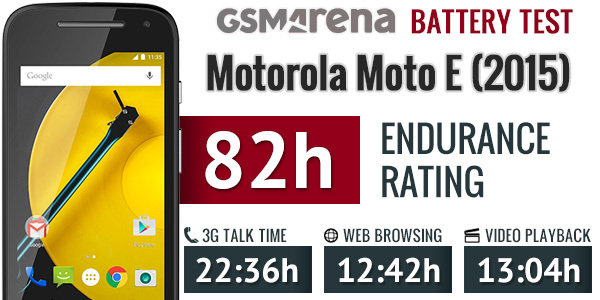 Naturally, we did our battery life test and we found the Moto E 2nd Gen acing all of our tests. It did great on the 3G call endurance packing enough juice to last almost a day. Then we ran our web script designed to mimic standard browsing routine and the Moto E battery went dead just a few minutes before the 13 hour mark. The video playback turned awesome, too – the Moto E looped our 1 hour video for 13 hours straight before its battery drained down to the critical 10%. The standby endurance of the Moto E (2015) is calculated in our final rating and the handset did above average at about 250 hours. All those impressive results led to the final endurance rating of 82 hours, which means you can count on about 3 and a half days if you do an hour each of calls, web browsing and video playback a day. The Moto E (2nd Gen) proved to be quite energy-efficient and will do much better than the Moto’s promise for “all day battery life” for sure.